Social Media Beta Test FAQs—There's Still Time to Sign Up! I found two industry news stories particularly compelling this week. The first was a relatively straightforward news piece published on BiomassMagazine.com about the higher costs of home heating expected this winter. The article featured some good nuggets including the expectation that heating oil prices will rise 20 percent and that 1 in 4 rural homes utilize wood heat for either primary or secondary space heat and that wood (cordwood and pellets) are the primary heating fuel for over two million households in the U.S. I’m from rural America. Our industry operates in rural America and this story demonstrates that rural America continues to utilize wood as a means of heating their homes and buildings. I think there is more opportunity for our industry with rural consumers and building a cohesive strategy around this market is climbing my list of strategic priorities for 2019. The second was covered by a number of outlets, but I first became aware of it via a Twitter post from KSL News Radio. In the story, it was reported that an EPA stove swap out program for certain counties in Utah had been fully utilized in less than one day once the application portal was opened. The program, funded by the EPA offered up to as much as $3,800 for participants willing to replace their wood appliance with a gas or propane-fueled stove or insert. What struck me was that in multiple places in the story and in the summary of the program, pellet-appliances were defined as an eligible appliance to switch away from, and not to. The Wood Stove Conversion Assistance Program maintained by the Utah Department of Environmental Quality is worth your review and attention. The page indicates that incentives are available for homeowners who wish to “Exchange an operational wood stove (including pellet) for a gas stove (natural gas or propane)”. To be fair, the program offered a smaller rebate ($500) for consumers wishing to stick with wood heat, but in the description of eligible options at the $500 level, pellet appliances are not mentioned. This story was a wake-up call for me. The simple truth is that wood pellet appliances have a great story to tell regarding the reduction of particulate matter. In fact, a list of wood heat appliances and their PM/per hour metrics maintained by the EPA shows that there are over 50 different appliances commercially available that meet or exceed the even more stringent 2020 PM emissions standards outlined in the New Source Performance Standards. We cannot cede important stove change out ground to gas and propane appliances. It is incumbent upon the PFI to educate the regulatory communities about our PM reduction story and position pellet appliances as favorably as possible whenever states look to stove swap outs as a means of achieving particulate reduction goals. This most recent story coming out of Utah shows that without constant vigilance and diligence, stove swap out programs, often used to increase the number of pellet appliances installed in American homes, could lead to fewer pellet burning appliances, not more. There’s still some time to reserve your spot in the PFI Social Media Beta Test! Please be in touch with Tim as soon as possible if you’re interested in signing up or learning more. Heat Local. Using wood pellets for home-heat helps the local economy. Wood pellets are an environmentally preferable, low-carbon, renewable home heat option. Wood pellets play an important role in sustainable forest management. 1. What is the ultimate goal of the sponsored content? Sponsored content will target social media users who may not be aware of wood pellets for home heat. Whereas a business can create posts that its followers will see, and boost the post beyond that audience to some extent, sponsored content will identify potentially receptive new audiences and target them multiple times. Sponsored content also enables us to test our ads and messages, and monitor stats like how many times our content is being seen or attracts engagement. In a recent test with a retailer in Pennsylvania, we were able to reach 30,000 Facebook and Instagram users an average of 2.5 times each. 2. I've heard there is a cost to post sponsored content on both Facebook and Instagram. Does the cost of the program cover these expenses? Yes. The cost of the program covers both a monthly ad budget of $100 for a four-month campaign and the cost of implementing the program. The cost for the full four-month beta test is $1500; the pellet fuels manufacturer and retailer are welcome to split that cost in any way. 3. Will my brand have a presence on any of the sponsored ads? This campaign is designed to raise awareness of pellet heating among receptive consumers and to send them to a knowledgeable local expert who can guide them through the purchase of a pellet appliance. During this beta test, we will be featuring the logos and websites of the featured local hearth and patio retailer wherever possible. We encourage pellet fuels manufacturers who are sponsoring retailers to work with those retailers to highlight your brand at the point of sale as a preferred or recommended pellet fuels manufacturer. 4. Why do I need to involve a specialty hearth retailer? Why can't I just promote my brand with this beta test? To create a new pellet fuels customer, that customer must first own a pellet appliance. With this campaign, we are seeking to introduce fresh, new consumers to the benefits of pellet heating. Hearth and patio retailers are on the front lines of selling appliances, so we want to a) introduce the concept of pellet heating to consumers and b) send them to someone who can advise them on installation. 5. What images will be used in the sponsored posts? We welcome all images of pellet fuels appliances and are happy to use photos supplied by the retailer. Our preference is for retailers to supply promotional photos of the products that they sell from the manufacturer. If promotional photos are unavailable, we will choose from the images that we've already collected. It's important that we feature photos of pellet appliances in an array of home environments so that viewers will be able to picture an appliance in their home. 6. My retail partner already uses both Facebook and Instagram for their business. Can they keep up with their other social media efforts while the PFI campaign is underway? Absolutely. We enthusiastically encourage regular Facebook and Instagram activity during the campaign—both for pellet appliances and for other merchandise the retailer may carry. The more visibility, the better. We also plan to work with each retailer's social media manager to re-post some of our ad content during the campaign. 7. My retailer would like to use this opportunity to highlight special offers for wood pellets and pellet appliances. Is this program flexible enough to allow for that? Certainly. We urge each retailer to provide us with a special offer for pellet appliances that we can feature in our ads. We can feature a new offer each month, or keep up the same offer throughout the season. 8. What kind of information will I and my retail partner be able to see during the test? We will share monthly reports that show the key stats of the campaign—including audience reach, clicks, post engagement (likes or scrolling through a slideshow, for instance), and more data. 9. How will we measure success for the program? Our ultimate goal is to promote the sales of pellet appliances, making progress toward Operation 100K. We'll measure success in several ways—the number of people reached, engagement with our ads, and retailer leads. If we are able to replicate our initial test from this summer in each of the selected markets, we will reach 250,000 or more social media users. We will also ask our retailers to keep track of how many leads they get from Facebook or Instagram and to report these numbers. *The social media beta program is open to manufacturer members only. We're building a collection of photos of our members, their pellets mills and product. Send them to Carrie Annand at [email protected]. 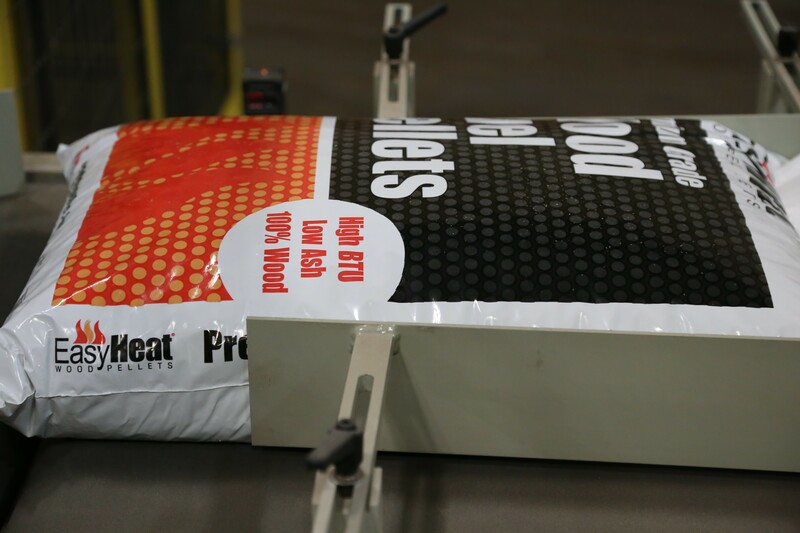 This week’s featured photo is a fresh bag of Easy Heat Wood Pellets coming off the machine, taken by Tim Portz during his recent visit to the Northland Pallet facility in Hugo, MN. We'd like to connect and interact with PFI members and anyone else involved in pellet fuels production! Follow us on LinkedIn, Twitter, and Facebook! Encourage your colleagues and other business associates to follow us. Send Carrie Annand news or other ideas to post on LinkedIn. Have News to Share on Pellet Wire? We'd love to feature your company's news in a future Pellet Wire! We want to be the first to know your company's recent developments to share them with the wider pellet fuels industry. Please be in touch with Carrie Annand with information on your company's growth, job openings, promotions, or other news. We welcome and encourage all interested PFI members to get involved in our committees. There are many opportunities to help steer the association. No matter where your expertise and interests lie, we have a committee that will suit you. Help us plan our next conference, shape our policy agenda, lead communications outreach, or grow the PFI Standards Program. Visit PFI's website for more information. Are you a PFI member, pellet manufacturer, or distributor that has fuel available? Email [email protected] to have your listing updated or added to the PFI website. The U.S. Energy Information Administration has released the October edition of its Short-Term Energy Outlook and 2018-2019 Winter Fuels Outlook, predicting that average household bills for most energy sources of home heating will rise this winter due to higher forecast energy prices. While temperatures are expected to be roughly the same as last winter in much of the country, the EIA expects prices for home heating oil to increase by 20 percent. The prices of other sources of heating are also expected to increase, with natural gas bills expected to be up 5 percent, and electricity to be up 3 percent. Expenditures for homes that use propane are expected to be about the same as last winter. Production of wood pellets continues to expand in North Carolina and across the South. Millions of tons are sent every year to be burned in power plants in Europe, where they're considered a form of renewable energy. But after heavy flooding from hurricanes Matthew and Florence, there's also growing debate over just how environmentally friendly they are. It’s a debate among competing ideas about how to solve global climate change. On one side is Enviva, the world's largest wood-pellet producer, which has three plants in North Carolina — and soon to be four. “We enable our customers to shift away from fossil fuels to fuel their facilities, and that reduces the lifecycle greenhouse gas emissions that our customers associate with energy generation,” said Jennifer Jenkins, Enviva's chief sustainability officer. Let’s start with the new grill. It’s a Traeger, one of those electric smokers that uses various wood pellets to add flavor, and Slick Leonard can’t wait to get back out on the deck and use it again. He grilled a couple of filets for Nancy and himself, along with baked potatoes and asparagus, the first time out, and Tuesday he went with chicken thighs. A pork tenderloin is in the refrigerator waiting its turn, and he hasn’t ruled out the possibility of cooking the Thanksgiving turkey on it, although it would take more than one to feed his five kids, 12 grandkids and six great-grandchildren. At his age, 86, and particularly in this hellacious year, Slick Leonard appreciates all the simple pleasure of life. He fractured his hip last January 5 when he slipped on ice while unloading some boxes at a church recycling center. After spending most of his rehab in a hospital bed in the family room at home, he returned to work the radio broadcasts for the Pacers’ final six home game, playoffs included. But then on June 15, while walking into a rehab facility in Carmel for another workout … “Boom! I go down again!” he recalled. Let’s just say that was quite a way for Nancy and him to spend their 64th wedding anniversary.